Mount Timpanogos is the second highest peak in the Wasatch Range in northern Utah, and arguably the most popular in the region. The granite mountain dominates the skyline with a 5,269 ft (1,606 m) prominence and a peak elevation of 11,752 ft (3,582 m). While I’ve lived near the mountain while going to school, I’ve never climbed it, so when a chance came to hike it while we visited family this summer, I jumped. Only, instead of doing the 14 mile (22.5 km) round trip as a day hike, I decided to backpack the mountain, doing a circuit of the two popular trails, starting up the Timpooneke Trail and descending down the Aspen Grove trail. 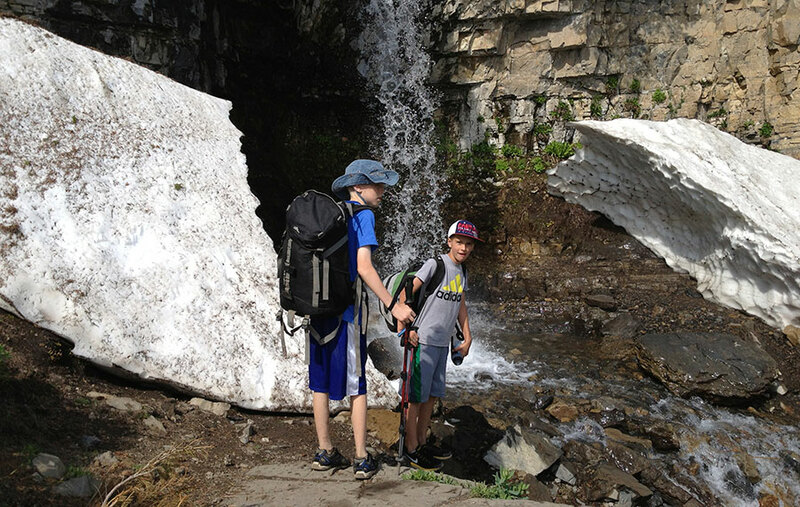 I convinced my son and nephew to join me backpacking where we hoped to meet up with other family members who were doing the day hike. With my two young companions in tow, we did everything possible to go lightweight, as we would have a difficult ascent and descent on the mountain and long miles on short legs. Bringing hammocks as our shelter was a no-brianer as we expected to encounter steep slopes and rocky terrain: hammocks would allow us to make camp nearly anywhere on the mountainside and were lighter than any 3-person tent. I planned on stacking the hammocks for my son and nephew so we could share tarps and further minimize our weight. We also packed lightweight down-filled quilts for insulation. We shared other items, such as our cooking gear, tarps, and first aid supplies. With water plentiful on the trail, we only carried 1 to 2 liters each. In the end, my son carried about 8 lbs (4 kg), and my nephew carried a little less (all his gear fit into a small school day pack). I packed all the food, which consisted of mostly pre-packaged dehydrated meals I was testing. My pack was hovering around 17 lbs (8 kg). Not bad for an overnight! Hiking up Timpooneke was spectacular. The vegetation was lush and the wildflowers were in full bloom. Water cascaded and seeped all around us and there were still several patches of snow that were scattered along the north face. Generally speaking, the Timpooneke trail was easy going: well graded, open, and easy to navigate. As we neared the top, there was one place where we had to traverse a small snow field that crossed the steep path, but we managed that without much difficulty. Although we were near the top and our proposed camping spot, the boys were famished, so we decided to have a trail dinner near one of the snow-fed streams. The water was cold, fast-moving, and freshly melted from the snow not far away, so we risked drinking it raw (gasp! no filtering). While the boys played with the snow, I cooked dinner. As luck would have it, I spilled half of the package on the ground as I was opening up the seasoning packets. Knowing we didn’t have a lot of spare food, I did my best to scoop up the dry food, picking up bits of rock and sand along the way. 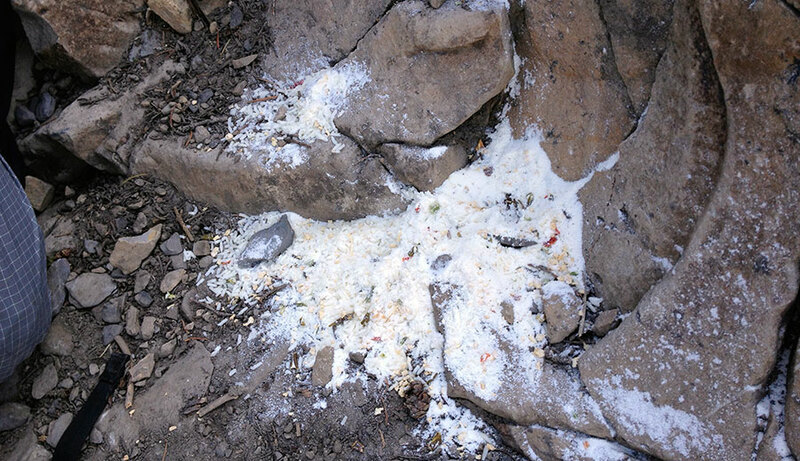 We joked a little as we ate chicken à la rock on the side of the mountain. As we neared the saddle that opened up to the Timp Basin, we saw a mother moose with her baby tucked up near a patch of snow in a thicket of grass and bushes, almost invisible. We were only about 10 m (32 ft) away. In this area, several large stands of pine trees offered great camping areas for our hammocks, but I wanted to push in further and see if we could find a place in the basin. I wanted to be as close as possible to where the Aspen Grove and Timpooneke trails converged, giving us the best possible location to greet our friends tomorrow. Timp Basin sits at 10,000 ft (3,000 m) elevation, and is practically above the treeline. I wondered if we’d find any trees as we were presented mostly with rolling hills of grass and scrub. I told the boys we’d go back to the edge and camp if we didn’t find anything in the basin. Miraculously, there were two stands of Bristlecone Pine right in the middle of the basin on top of rounded hills. We noticed that some campers and picked one stand of trees, so we headed out to the other. The site was near perfect. The little copse of trees provided ample hanging spots for a half-dozen hammocks, closely spaced. One of the pine trees had huge sections of bark recently torn off. At first I wondered if careless campers had done this, but on reflection, I figured it was probably the work of animals. As the sun dipped behind the ridge line, we noticed a large group of bighorn sheep walking along the trail in the direction of Emerald Lake. Do bighorn sheep eat pine bark? I wondered. We were warned from descending hikers that the summit trail was difficult, if not treacherous, due to snow fields covering the path and the steep ascent. As we talked as a group, we decided not to make a summit attempt in the morning. Knowing we had saved a few hours from our hike tomorrow, we decided we could eat tomorrow’s lunch for a “Hobbit” dinner, as our meager, debris-filled trail dinner wasn’t very satisfying and we were all still hungry. Not long after our second dinner, the sun cleared the ridge line and wind began to whip up through the basin toward the summit. It was an interesting phenomenon that lasted a few minutes and then stopped as suddenly as it began. The wind returned twice in the night, in the same fashion, otherwise it was calm and remarkably warm in the basin. I packed expecting frigid temperatures, but even with the wind, it remained in the upper 50s°F (10°C) through the night. I was up early the next morning and caught the sunrise as it painted the peak in golden colors. We couldn’t have picked a more perfect spot for our camp. I let the boys sleep in a few more hours as I kept watch on the trail for any hikers. By 7 AM, the first groups began to reach the basin and we had begun to prepare breakfast. We were expecting our family to hike up the Aspen Grove trail, so our attention was focused in that direction. All our hammocks were fitted with double-sided stuff sacks, so packing was quick and easy and we were on the trail by 7:30 AM. 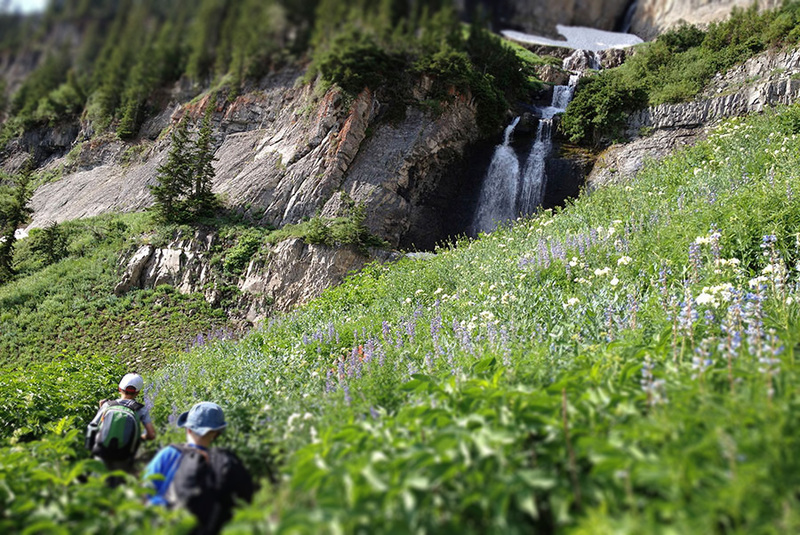 Getting up to Emerald Lake and the Aspen Grove trail meant traversing a steep talus field. Going was slow as the trail was narrow and the steep slope was intimidating. As we neared the saddle, the trail was covered with snow with a shear cliff on one side. The boys were nervous and I was scared. I was glad we decided not to go up to the summit; we could see how the trail was covered for about a half mile in snow and ice. The cirque at Emerald Lake was beautiful. We stopped and filtered water and began our descent, noticing the big horn sheep on the hill. As we turned the corner down through a patch of scrub oak, we came face-to-face with a bighorn ewe and her baby. We snapped a few photos before they bolted. It was invigorating. If our blood was pumping after the sheep encounter, it was reaching arrest as we made our way down Aspen Grove trail. This trail was murder compared with Timpooneke. Our pace slowed to a crawl in places where the path became steep, narrow, and snow-covered in places. We all complained about the maintenance of the trail and wondered how so many people made the ascent. I vowed never to hike the Aspen Grove trail again. Despite our fears, the views were amazing. All around us were thundering waterfalls and lush vegetation. As we descended, we entered places that were thick and jungle-like. As we passed hikers, we tried to estimate how much farther we had until we reached the trailhead. Everyone seemed to have differing opinions so we stuck with our trusty time control plan. We reached the parking lot at noon, right on time. The Aspen Grove trail has a very steep section between Emerald Lake and the trail head. I am surprised that there was so much snow on the trail. If you hike the trail in late August or Early September there usually isn’t much snow left. I don’t want to be a jerk but I have one minor detail to point out. The photograph above is of a Mountain Goat and not a bighorn sheep. Thanks, I wondered about that. We did see some big horn sheep, but the photo is not that. Bwahahahah…. I’m so glad someone pointed out ‘that was a goat’…. Bwahahaha…. Great little ditty… Loved it! Reminds me so much of when I was out on the trail with my boys…. Made the Timpanooke hike to the summit several times over the years, and once over to the airplane wreck to the north. A great hike but a bit long for one day, especially if there is still snow. Wildflowers are absolutely incredible. 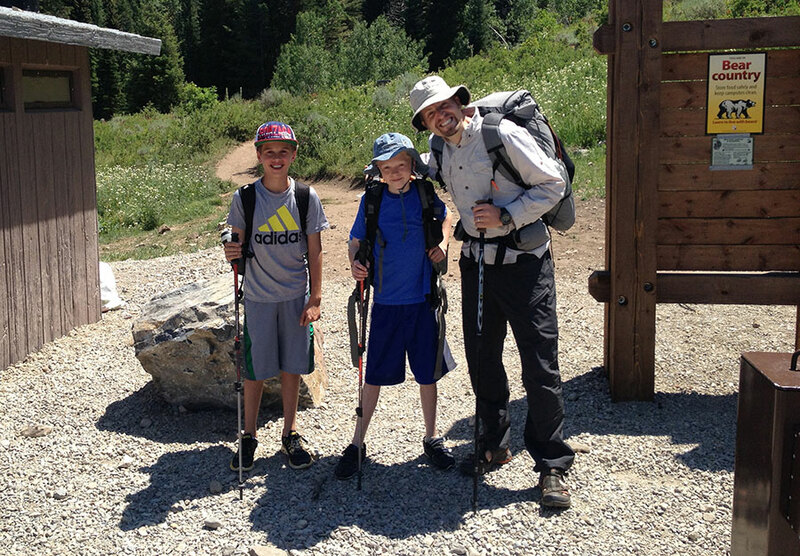 I have wanted to camp at the green meadow for years – glad to read about your experience. Little question… How were the mosquitoes? Looking forward to this! Are you planning a backpacking/hammock trip on Timp! I’m eager to hear how you enjoy it! Mosquitos weren’t much of a problem when and where we went, but having a bug net is always nice. Hi Derek. We plan to hike timp on Sunday to monday. I’m dying to use my hammock. The girls I’m going with don’t have one. We are planning on hiking to emerald lake and camping. Are there trees, and a flat tent spot over there? I’m wondering if I should just plan on taking our four woman tent, or if I can hang. My email is brihoopes@gmail.com. would love any tips. There are places to hang up there. Lots of water and lots of trees. I scoped out several spots I would have set camp that weren’t right on the lake. I think you’d be fine to bring a hammock provided you don’t care about being 1 foot from the waters edge.